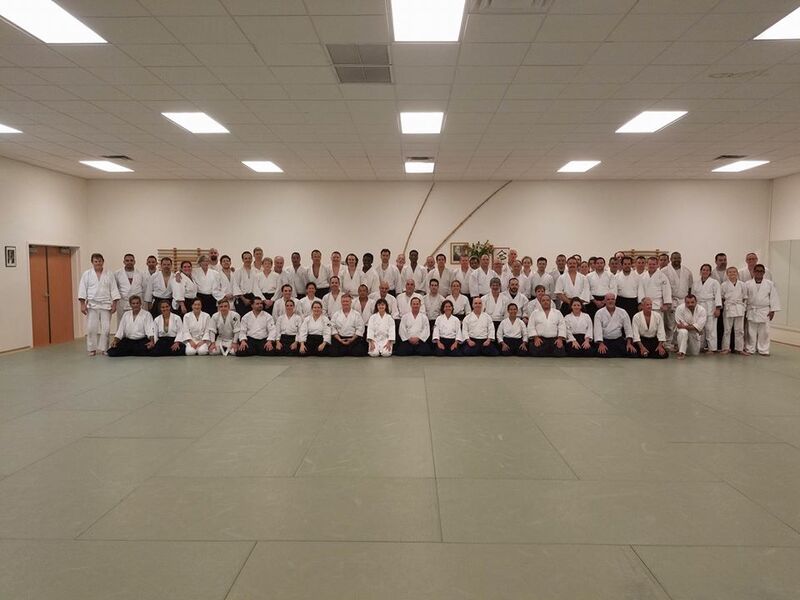 So it was the annual Claude Berthiaume Sensei Aikido Seminar at Florida Aikikai. Which happened on August 20, 2016 through August 21, 2016. For me, it’s a highly anticipated event and one I can’t wait to attend. 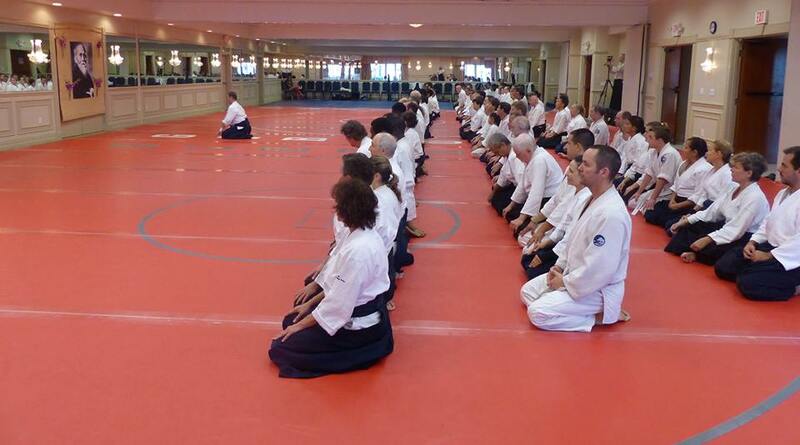 Berthiaume Sensei’s dojo is Aikido de la Montagne which is located in Montreal Canada. One thing I have always liked about Berthiaume Sensei is his attention to detail. He breaks moves down by verbally explaining it while making the uke move so you can visualize it take it out of the esoteric realm. For instance, in doing a shihonage, he was demonstrating to move the uke’s elbow in the direction that the uke was going. But to also move your hips, your center, in that same direction. You move from your core, your torso. You move around your spine. The result, your uke ends up moving to places he did not intend to go to. Essentially what happens, is that you “disappear”. Your uke is off balance and going somewhere he never expected. It’s like opening a door when you don’t have your balance. Uke’s control of himself, is lost. 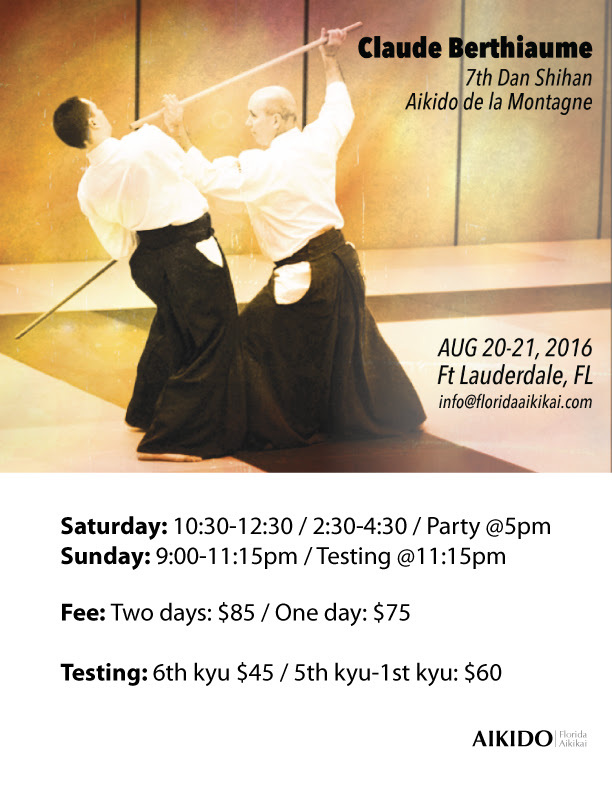 For non aikido readers, uke is your training partner. Specifically, uke is attacking you. Berthiaume Sensei went deeply into breaking body form. I don’t recall him doing this before. It was really, really good. Breaking form is a vitally important concept. It entails compartmentalizing the body into separate zones; certain areas of the body that are more easily manipulated than other areas. Breaking down the parts to affect the whole. The areas to affect are wrist, elbow, shoulder, hip, knee, and ankle. He didn’t go into every area but did hit on elbow, shoulder and hip. While he did not come right out and talk about it like this, it’s what I heard him saying and saw him demonstrating. It’s attack dependent. You use the body part of your uke to manipulate their center. As was shown, your uke attacks you with tsuki. You move slightly off and out of the way to such a point that the tsuki is going past you. A tsuki is a punch, typically to the gut. Depending how you moved, you are either still facing your original direction or the same direction your uke is facing. Either way works. You now find yourself behind your uke’s center. And you are in a position to completely manipulate and devastate your uke with absolute minimal power on your part. I only attended on Saturday. And it was time well spent. Besides being an overall great guy, he’s an awesome martial artist. He is on the USAF technical committee and that’s a good thing for Aikido. Bernath Sensei instructing us on jo. 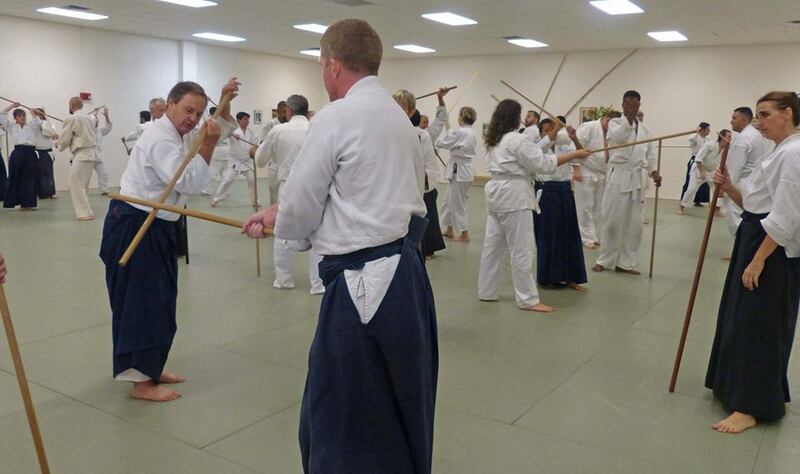 The annual Florida Aikikai Winter seminar was a smash. This was the 35th anniversary. I was told this was the highest attended seminar we have ever had. Check out their Facebook page too for great info and pics. There were no Japanese shihan present this year. Bummer. Yamada sensei was scheduled to be there but he was having health issues and did not attend. The lack of Japanese shihan was not the cataclysmic end of the world that I had worked up in my head. To the contrary, it is was a prophetic sign of things to come. The next generation of aikido leadership, currently made up of the technical committee, is the future and it is in the here and now. The biggest thing I saw in this seminar was the imparting of knowledge by the teachers. Everyone of them took the time to explain and show in great detail the moves they were doing. I don’t ever recall that happening before at a winter seminar. It has always been my experience that the teachers show a move then walk away and leave us to ourselves to figure it out. 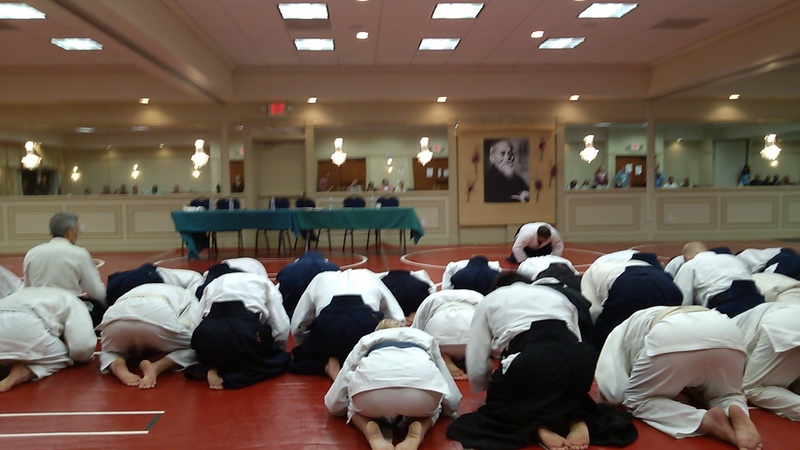 They of course walk through the throngs of sweaty aikidoka and critique what we are doing. It’s effective but hugely different than having a teacher show the whole class from the beginning what it is they are doing and how to do it. I attended on Saturday and caught every class on the mat. I did not attend any of the outdoor weapons classes. I was more interested in what was going on inside; both figuratively and physically. I want the internals and I got it. 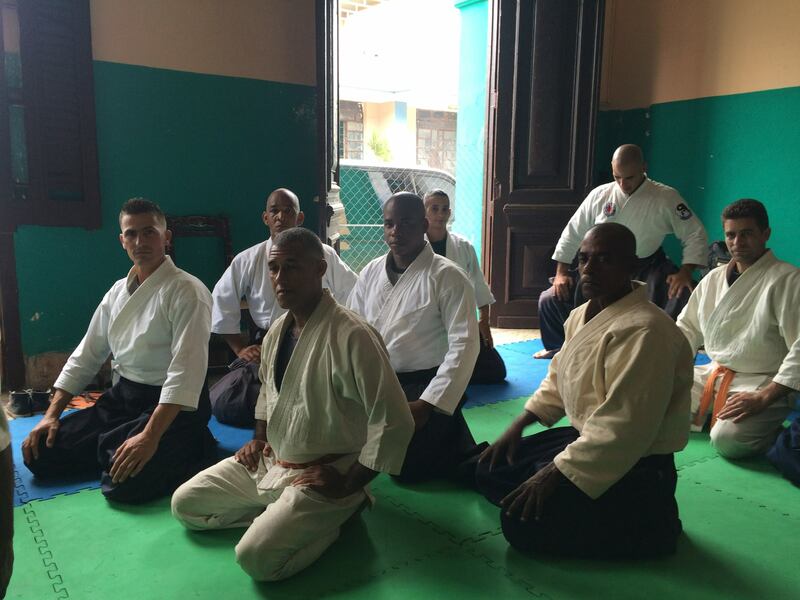 Berthiaume Sensei was the first class at 9 a.m. What is there to say about this sensei except that he rocks. Every class I have ever taken from him has always been a learning experience. He was particularly focused on getting your opponent off balance. This idea being the integral portion of the movement. Off balance, kazushi, IS the recurring theme. Until it happens naturally, primarily and automatically, it will remain the as the theme. None of the moves we did stand out as anything extraordinary. In other words, we did basic moves. But sensei delved into great detail about manipulating your opponent in the course of the move to get their balance. For instance, on a tsuki kotegaeshi, he explained to let the tsuki (punch) move past you and in so doing, your opponent then is off balance in a forward position. From here, you can go into a variety of throws. Or just help your opponent keep going in that direction and hit the floor. The next class was Zimmerman sensei. He kept the information flowing. As far as movements, we did basics. But sensei went into detail regarding body form and manipulation. He made a point to the effects of joint manipulation effect other parts of the body. For instance, ho lding an opponent’s elbow from a tsuki and pushing it across his body and pointing it up and out has the effect of moving your opponent’s hips in the direction the elbow is pointing too. Simple enough but as a practical matter, never done by us underlings. Next was Demko sensei. I am always intrigued by him. Physically, he’s huge. He’s a massive guy but he’s light in his movements. He kept the information flowing too. He made points regarding slowing your movements down to increase the flow with your opponent. The next class was Pimsler sensei. He kept the information flowing too. But, he took a different approach than the previous sensei’s. He was brutal, in a good way. I think he was the most concerned with imparting the minute details to what he was showing. He concentrated on making sure what he was explaining was understandable; that us laymen could take what he was saying and apply it. The last class of the day was Konigsberg sensei. What can I say. He’s the bomb. 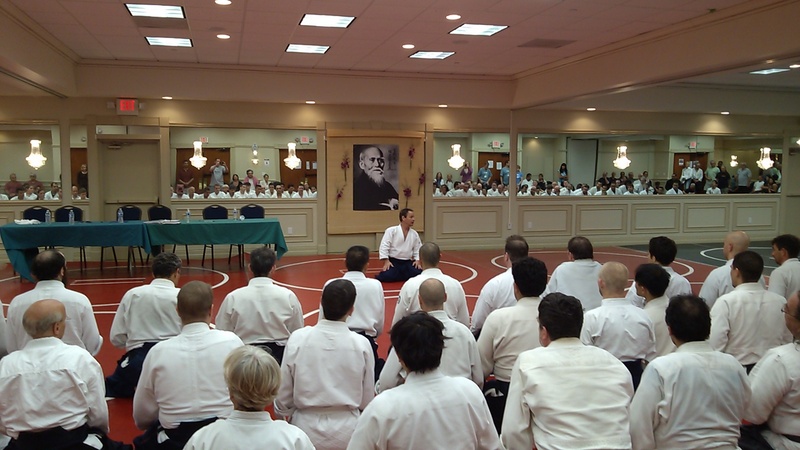 All in all, the seminar was excellent and I like the direction Aikido is going. It’s evolving and I like it. Oh man. I don’t even know where to begin with this seminar. How about totally awesome? This seminar was a life learning experience. It bridged the point where Aikido became life instead of being just a part of life. There is a lot I could blog about regarding this excursion. But, I am going to keep it focused on the Aikido aspects. Let me get the specifics taken care of. 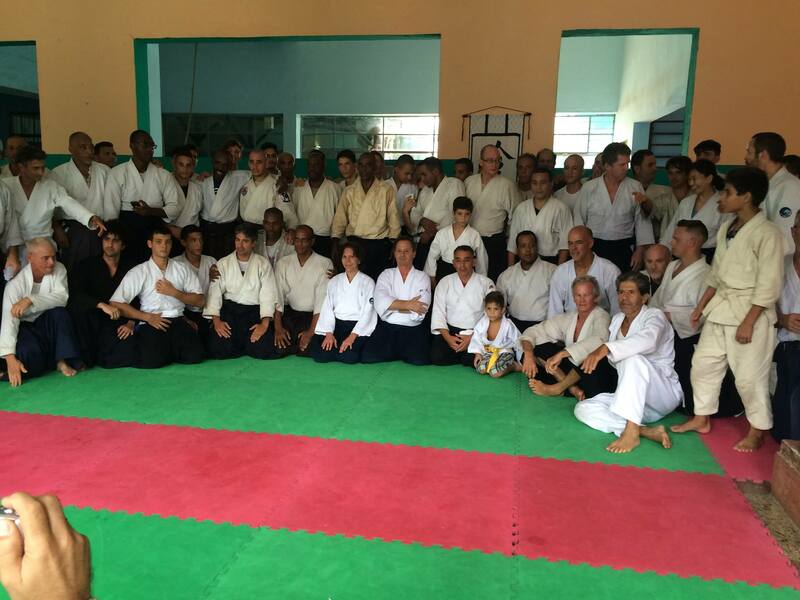 Peter Bernath Sensei, Penny Bernath Sensei and a few members of Florida Aikikai went to Havana Cuba to practice with our Aikido brothers and sisters at Asociacion De Aikido Aikikai Cuba. 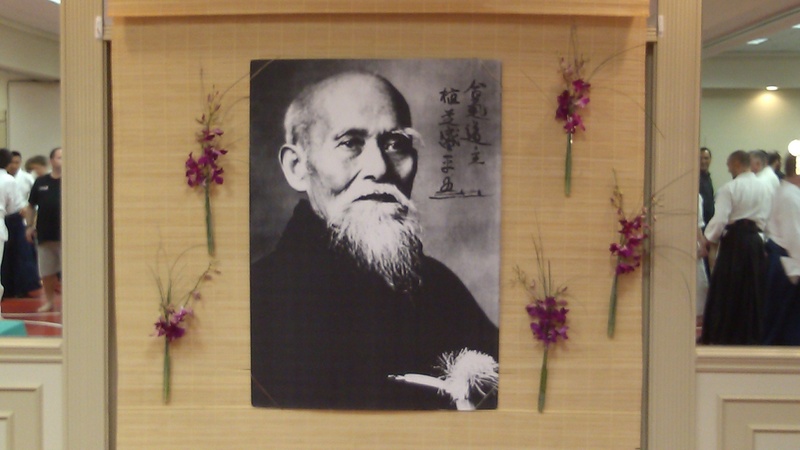 The first thing I have to blog about is my sensei, Peter Bernath. I have never been to a seminar of his outside the annual Aikido winter seminars and the ones we have at our dojo. Peter Sensei is the real deal. I saw a side of him I have never seen before. He was massive and powerful in his movements and more importantly in his intent. I was in fear and awe of the guy. He’s a true warrior shihan. Peter Sensei taught the moves I have seen him do a million times. But this time, he added more information and specific details about what he was doing. He was giving us all his secrets about movement. For instance, on Friday night, we were working on tsuki movements. At home, Peter Sensei shows us the move with some instruction and we go at it. In Havana, he went into great detail about breaking your opponent’s form. Taking your opponent’s momentum and power and driving it right back into them. Taking the elbow and pushing it down into your opponent’s hip and disrupting their center. It’s a sublime and powerful move. On Saturday, Peter Sensei was using utemi like I have never seen before. He was using utemi to manipulate mai and space in order to get his uke off balance. But he never lost connection. I have seen him do this a million times, but this was the first time I ever saw it! I have always known the guy is a natural. Watching him in Havana reaffirmed that knowing. I guess I am spoiled having been taught by him since 1998. You never realize what you have until you get out of yourself and see your life from a different perspective. Let’s just say that the Havana dojo is male dominated. It’s a guy’s place. Friday night Penny Sensei was working out with the general population. In other words, our Cuban brothers weren’t giving Penny Sensei an inch and she reciprocated. They were making her battle and I am sure they didn’t know who she was. During her class, Penny Sensei proceeded to beat the tar out of her ukes. I know, I was one of them. She was on fire. She was showing us that being a warrior isn’t just for men anymore. I must add that our Cuban warrior brothers and sisters were a strong bunch that knew how to hit and liked to hit. They played hard and hit hard. I don’t have a problem with this for three reasons: 1. it keeps it real, 2. the harder the opposition goes, the easier it is for me to get them off balance, and 3. it gives me an opportunity to work on softness and integrated body principles. I could go on and on about this trip. There is lots to talk about. I originally started writing this post the week I got back from Havana and have been working on it since that time. The hardest part was reducing it down to just a few hundred words in order to make it bloggable. I will sum it up this way: it was an awesome seminar, trip and life experience. I can’t wait to go back. 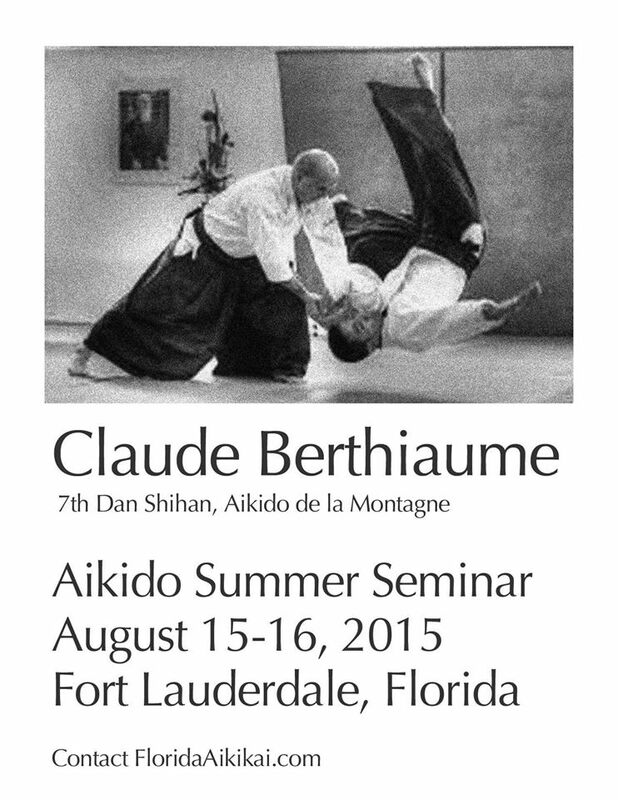 Claude Berthiaume Sensei gave a seminar this past weekend: August 15 & 16, 2015. What can I say except this guy rocks. I threw my back out a few days before and could not move without severe pain. But, I did not want to miss this seminar. 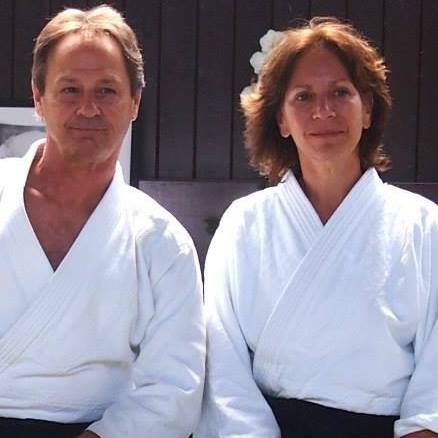 Berthiaume Sensei really has a deep and innate knowledge of Aikido and body mechanics which is borne from experience. For instance, when he was showing techniques, he broke it down to individuals parts: opponent grabs wrist, then your elbow goes around the power of the grab instead of directing your energy into the oncoming assault. Its crushing to your opponent. To look at a wrist grab in its totality, it’s easy to miss the subtle things that make it really work. But its the great practitioners that make it look effortless and then enunciate it to wanna-bees like me. Another move he did, that I like and see it as a Chiba sensei technique, is to respond to a wrist grab by folding your arm into your chest and elbow going around the power of the grab. Your hand goes one way into your chest while your elbow goes the opposite way, not unlike a fulcrum. Outcome, your opponent feels like he opened a door and fell through unbalanced. Exactly like that situation when you go to open a door and someone on the opposite side happens to open it at the exact same moment you do. You lose control and fall into the open room your balance all out of whack and your brain at a loss in its response. Berthiaume Sensei also made a point of keeping your elbows in close to your body, in certain instances. This has the effect of bringing your opponent into your comfort zone and eliminating the fight. It keeps your center and takes your opponents center. Plus, it guards your innards from any stray punches to the mid section. I must point out that he also said to keep your opponent at a distance by not folding your elbows in. Elbow power is a situational dynamic. What I took as the essence of his seminar is to break down the whole into its parts and reconstruct it with fuller and more integral meaning. Use more intent and less power to become dynamic. Paradoxical thinking right in line with a martial art that calls itself non-violent. As usual, a great seminar. Konigsberg Sensei came down for a seminar. I can’t remember how many of his seminars I have been to over the years. They are always awesome. An aikido friend of mine once referred to Konigsberg Sensei as a “burning ember”. This always stuck with me and made sense. He is such because his movements are explosive. He stays in stasis until something causes him to respond. Just like an ember that can ignite into flame. The teaching I took away from this seminar was to keep my shoulders down and move from your hips. Access your body centrally and in a unified way. This is the dominant theme in my martial arts life. Konigsberg Sensei was stressing the point that you must engage and move from your center and also engage and move your opponents center. You must enter the dynamic sphere. 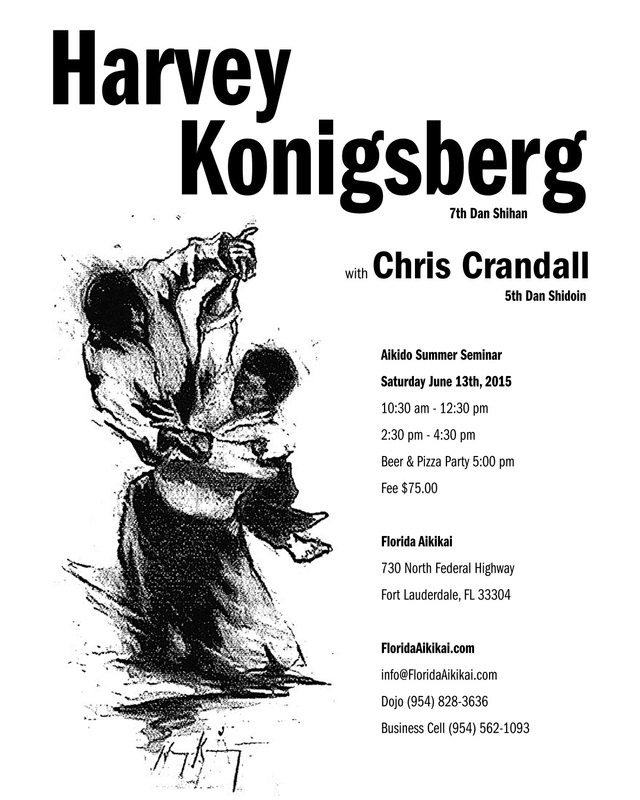 Crandall Sensei I have never met before until this seminar. He taught the first hour class. Crandall Sensei was very good. He is a physically powerful guy who used small movements. His style is similar to Konigsberg Sensei. Crandall Sensei stressed movement to center and demonstrated a real nice technique of aiming your thumb towards your own center from a wrist grab.This completely destabilizes the strongest opponent. It catches you off guard without a doubt. Its like when you reach for a closed door and someone on the other side happens to be opening it at the exact moment you are opening it. You get that feeling of falling off a cliff. Your balance is falling forward and you are gone. I already knew of this technique, but it was nice to be reminded of it again. And his version was quite effective. 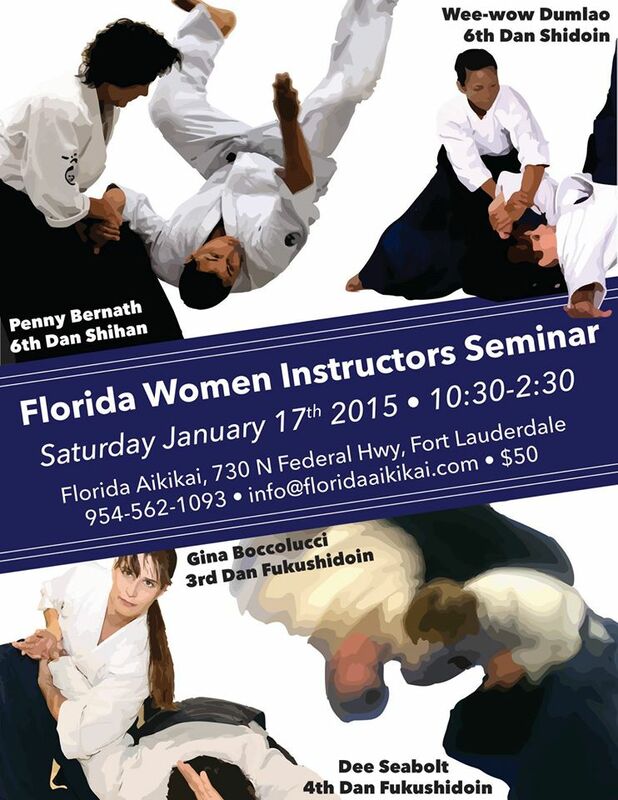 I attended the Florida Women’s Instructors Seminar on 1/17/2015 and I think this picture says it all. Look at the beaming smiles! It was a great seminar. And the most amazing thing to me was the level of “martial” that was present in the teachings. Dare I say it, but I thought there was a higher level of martial spirit in this seminar than in any seminar I have attended in a long time. Three words; women warriors rock! Sensei Penny did a real nice approach using groups of three in order to increase awareness and keep the intensity up. She did a lot of utemi work along with going into the opponent’s center for effective unbalancing. Stealing the center. Sensei Weewow taught an informative class. I was quietly amazed at how she was teaching Dan Harden concepts. I didn’t think she followed Dan. The strength is that the concepts she was teaching are universal. Sensei Seabolt was extremely martial. I loved it. She did a lot of take down moves such as the opponent coming at you with a tsuki. Her response was to move off center, going down to a knee and helping the aggressor to follow the force of his punch, ultimately winding up in a heap on the mat. She did it with great fervor. 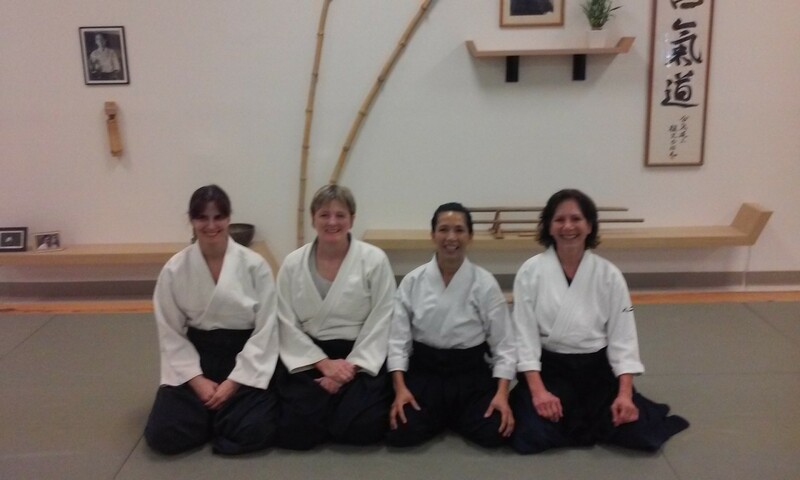 Sensei Boccolucci taught her first seminar. If she had never mentioned that, no one ever would have known this was her first. She was flawless and in keeping with showing that women are brutal. She did a great class that focused on basics. After she was done showing her technique, she would say, “get back to work!” Which I think summed up the seminar. Another excellent seminar. However, I must admit that I had the flu and only worked out on Saturday. I also did not get any pictures this year. I was out of it. I attended Yamada sensei and Shibata sensei’s classes. 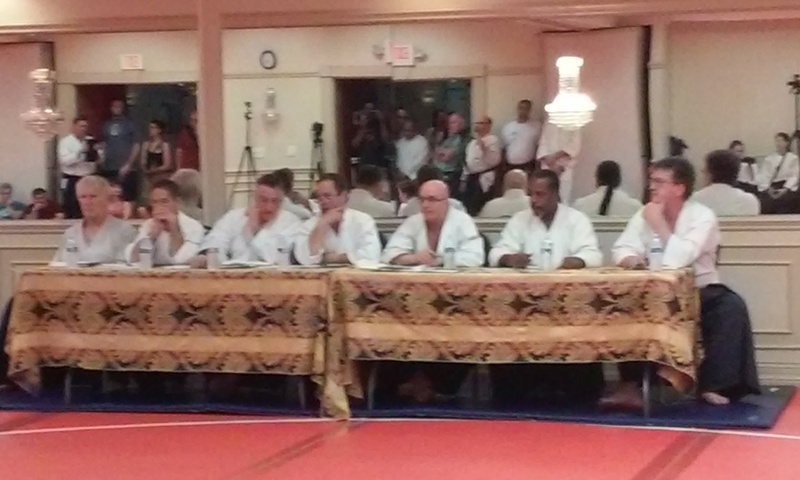 Those two were the only two Japanese shihan in attendance. I am always amazed with Shibata sensei. Either I see things differently now or Shibata sensei was doing moves that were akin to daito ryu and pulling silk. For instance, he would draw his attacker in and use that energy to off balance his attacker and then drop him. Using that energy from the attacker opened up a bunch of different points in which to exploit the attackers balance. Instant kazuchi. I also noticed that Shibata sensei used the quiet space between movements in order to get the feel of the attacker; to keep connected. Its as if he is engaging the etheric body and the energy tendrils. Your attacker puts out so much energy in his attack that if you slow down and move amongst the breath, the wind from the attack, you can get deep inside that person.This is something I have been trying to learn and apply. He does it. I emulate it. A sad note, on Sunday, Shibata sensei said he would not be doing anymore seminars. He said he would not be traveling. I guess I will have to make a pilgrimage to his dojo. I must admit that I dropped the ball in not posting all of my Winter Seminar Experience. I will have to go back over my notes and provide detail. I posted some pictures below. The pictures don’t necessarily correspond to the words I wrote. For instance, there are no pictures of Shibata Sensei or Berthiaume Sensei. 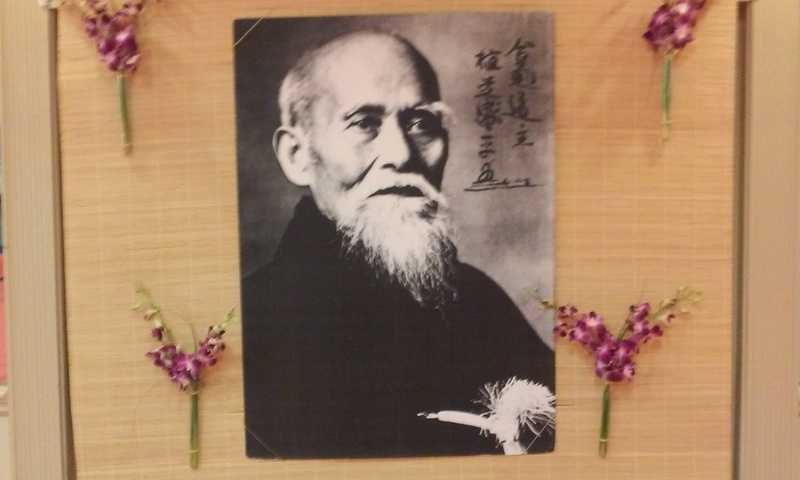 There is a picture of Bernath Sensei teaching class. 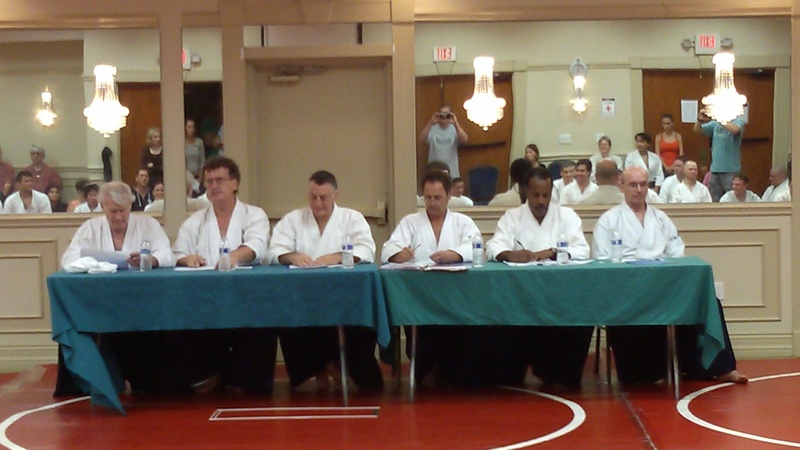 And a picture of the Aikido Technical committee grading a test. If you look real close, you can see me in the mirror taking the picture. I also posted a picture of the kamize. But, I can assure you of this, it was awesome. I attended the last two classes of yesterday’s seminar. Unfortunately, I could not make the full day schedule. I took Shibata Sensei and Berthiaume Sensei’s classes. Shibata Sensei is one impressive guy. I swear every time I see him he moves faster, quicker and more powerful. Time is not slowing him down. Shibata Sensei was doing some great kokyu nage moves. He makes it look so easy and effortless. I also noticed that he moves in a spiral not unlike how O Sensei moves. Everything about Shibata Sensei was a spiral. Amazing. Sensei Berthiaume was showing some awesome shihonage work. He was doing this one thing where you rotate/spiral the attacker’s hand and it makes his whole body move. 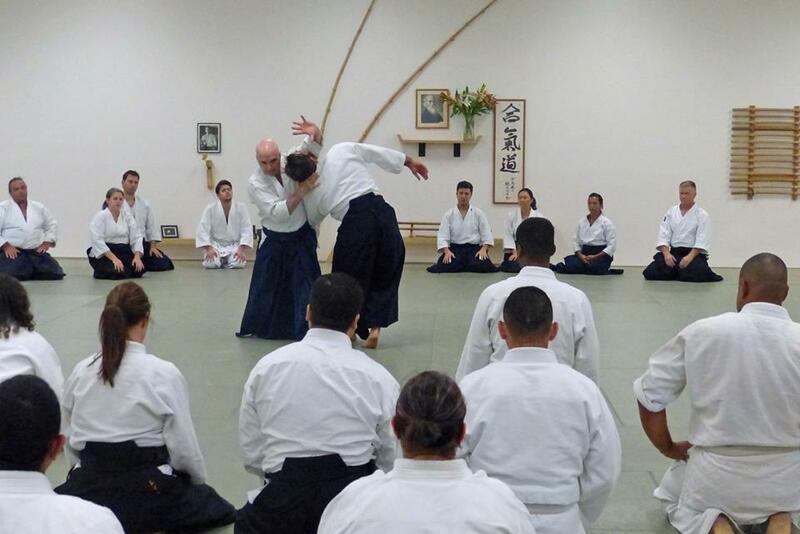 was working out wiht Eliott Snsei from Miami Aikikai on this move and it was impressive. He was moving my whole body from hand down through the opposite foot just by spiraling/rotating my hand. Nice stuff.